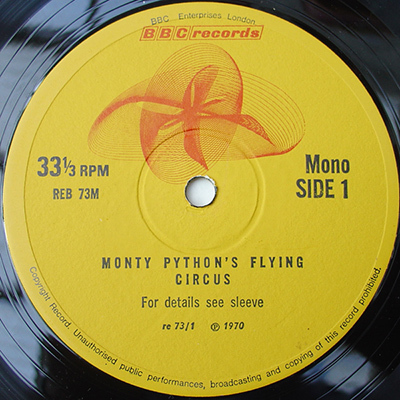 The first ever Monty Python spin-off, this vinyl album was released in 1970 and featured re-recordings of sketches from the first series, cut in front of a live audience. The cover was designed by the show’s animator, Terry Gilliam. 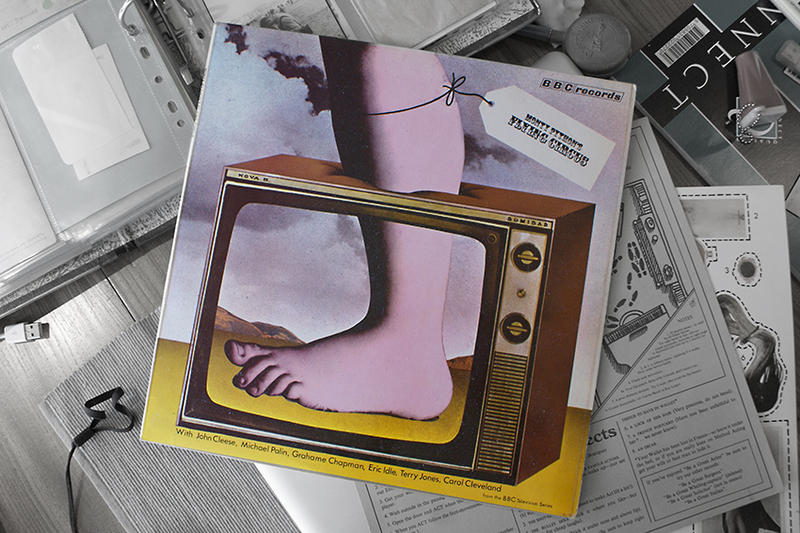 He used the now famous giant foot from the programme’s opening sequence (Gilliam lifted it from Agnolo Bronzino’s Venus, Cupid, Folly and Time), and stuck it through a cut out image of a sixties TV. The resulting hand-tinted montage makes a striking cover and one which is instantly recognisable to anybody who knows the show. While a number of the later Python album’s also had fun with subverting the concept of the sleeve itself (their Contractural Obligation and Another titles in particular), this remains perhaps the best. The copy I picked up the other week appears to be a second edition (REB73M) with a white and blue BBC label (the first press had an older short lived yellow label with a ‘spirograph’ type image on.) The sleeve notes on the back include notes from the show’s producer and various contemporary reviews of the series from 1969. What clinched it for me though were the survival inside of two printed cards featuring more Python silliness. This “Be A Great Actor” presentation features a cut out Oscar award, telegrams to post around your dressing room, a shot off toe and other essentials for the budding actor. I imagine it’s quite hard to find with this still inside. BBC Records was an eclectic catalogue at the best of times, and they could never compete with the major record labels for budgets or sleeve art but the albums do have a certain vintage charm about them. There are some of the BBC Sound Effects sleeves on the site and their language lesson covers are also very well designed.